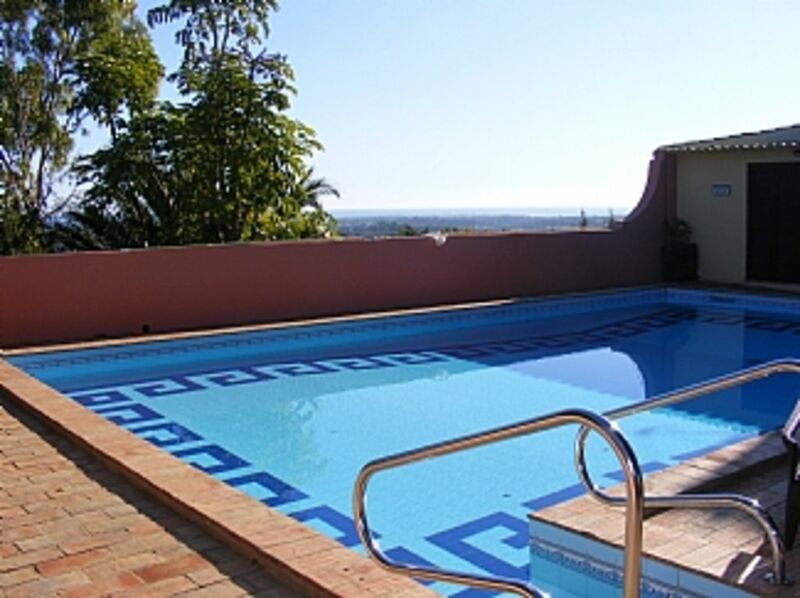 Cottage vicino a Moncarapacho, Algarve - Splendida vista panoramica sul mare, piscina + relax! Rispetto per le coppie che hanno seriamente bisogno di ricaricare le batterie. Con un meraviglioso letto da 6 piedi, bagno privato e splendida vista sul mare. Hai un 60 mq. piscina, nuoto serio, aria condizionata, WiFi 4G, DVD e CD Bose. Il relax è garantito in questo paradiso autonomo. Adagiata sulla sommità di un promontorio di Sao Miguel, la vetta più alta dell'Algarve orientale, con vista panoramica mozzafiato sul mare (15 minuti di distanza), la tua casa si estende a zone coperte private che includono barbecue a gas o carbone, fornello supplementare e tavolo di marmo gigante . Le viste sull'Atlantico e sulle montagne dietro di noi sono meravigliose, sia dal cottage che intorno alla piscina. I grandi giardini maturi, con alberi di fichi, limoni e aranci e un prato sono a vostra disposizione in privato. Il mio pacchetto di benvenuto è leggendario tra i miei ospiti, io sono un cuoco Cordon Bleu ed è tutto fatto in casa. Al vostro arrivo avrete vino, birra, pollo, hummus, paté di fegato di pollo, maionese, succo d'arancia appena spremuto, o qualsiasi altra cosa decida di fare. *** DA QUEST'ANNO in poi c'è l'opzione se si vuole portare amici o parenti ad affittare una camera king size con bagno privato e ingresso e terrazza, questo sarà affittato solo a voi. Pls si rivolge direttamente a me per i prezzi. Great views in every direction from the hilltop home. Our host Joan was very welcoming, helpful and knowledgeable about the area. The welcome pack was delicious and much appreciated. An ideal location for visiting the Eastern Algarve. We would recommend this to anyone looking for a cosy hideaway. The main thing is you enjoyed yourselves and had got a taste of the Eastern Algarve. The weather was sometimes against you, but you were intrepid and going for an adventure every day. Hopefully you will come and really explore the Eastern Algarve in the future. You are always welcome at the 'little hideaway'. Safe journey back to Canada. Although a little remote - meaning car hire is essential -Joan is the perfect host and the cottage has everything you need. The Welcome Pack is excellent and despite it being February we loved having breakfast on the patio every morning. We also visited Lisbon for a few days (a very easy and affordable train journey from Fuseta) which is one of Europe's greatest (and cheapest) capitals. The dogs are friendly (we're not dog owners) and do not intrude. Joan is extremely hospitable and we enjoyed having drinks and dinner out one Sunday with her and friends. It really is a home from home but with far better weather! It was great fun having you here, and I am so glad you enjoyed it. It was great you met some of my friends, and got on so well with them. The weather was fantastic as you say. This is a special place (not for everyone of course), yes 'home from home' especially when you have to sort out my internet Steve! All is 100% now, and my new Canadian guests say it is perfect. What can we say about Joan, that hasn't already been said. Such a lovely warm welcome on top of the fantastic food hamper that we were greeted with. The cottage is very cosy, comfortable and has everything you need to have a great holiday. It was my 60th birthday while there, and Joan very kindly hosted a party for me and invited some lovely friends and using the fabulous BBQ-ing facilities, we all had a great evening. Thank you Joan for making my birthday special. The dogs, Bella, Bear and Bogalina were always on hand for our doggy fix while away from ours. So if you are looking for a relaxing, rustic beautiful place to holiday, look no further, you won't be disappointed. Joan's warm welcome is worth the price on its own. What a wonderful review, thank you. This was your first visit to the cottage, and you made the best of your time here, exploring and of course you had wonderful weather. Your 60th Birthday was great fun for all of us. And Mark you did all the cooking. And it was quite delicious. One day you were using the charcoal barbecue, and the next one the gas one. Brilliant.... Bear went straight down to the cottage this morning, and you had gone. Look very forward to seeing you both again in 2020. Don't forget photographs of your prize winning dahlias! We had a lovely week in the appartment in Moncarapacho. Inside there is everthing you need, to cook etc. The terras is also good whit the huge marble table and sun and shadow. Swimming pool whit lots of chairs and a stunning view. And i forgot the excellent bed in the apparment. When we came the first day , we had a very warm welcom from Joan, wine ,chicken en prawnsalade, delicious. Totally relaxing, beautiful property within short driving distance of local village and other area attractions. The owner, Joan, is a gem! Her welcome basket of wine, chicken, seafood spread and snacks were a real treat. There is a charming tableau everywhere you look about the property... tables with candles for sitting and chatting over an evening cocktail, bistro lights hung overhead. Bougainvillea bloom everywhere and the sun kissed villa sits atop a hill overlooking the sea. The fresh air is wonderful and there is a lovely breeze.,,, So relaxing..... perfect for the travelers who want something different from the usual hotel or tourist experience. The kitchen was well equipped, the bedroom was cozy and the bed itself was amazingly comfortable. Nice hot shower, washing machine if you need it. Joan has put together the perfect relaxing getaway for her guests. One feels like a welcome friend with complete freedom to enjoy the property as you wish. We truly hated to leave and hope to return! Where to start! We without question love this Hilltop Cottage (our 2nd visit this year!). Nestled on a hilltop just outside the quaint town of Moncarapacho with outstanding views. Joan, the owner and hostess with the absolute mostess is an total gem and the cherry on top of this spectacular property. Joan's hospitality knows no bounds and she makes you feel very very welcome. Despite this being a self catering stay, Joan goes out of her way to give you lots of information prepare about the area and provides the most amazing welcome hamper, something she doesn't need/have to do, but goes the extra mile to ensure that her guests have the best start to their holiday. It's such a lovely personal touch. Thank you Joan. The cottage has everything you need for outdoor and indoor living, seating areas, bbq, gas and charcoal (yes she even provides gas). Again self catering, so this is another personal touch. The pool is the biggest I've seen and the outside area and garden are just lovely. Sit and relax in the Portuguese sun and just let the stress slip away. Chairs, sunbeds, in the shade out of the shade, lots of places to let the hours tick by. Joan is very knowledgeable about the local area and has left information in the cottage on places to go, where to eat etc etc. We were able to book a taxis as we wanted to go out and have a drink and not have the hassle of driving, again information in the information booklet. I would say a car is essential as there is so much to do and see (if you don't want to chill by the pool that is!). However using taxi's to and from the airport and while you are there is also possible. The beach is about 3 miles away in Fuseta and Joan has kindly left cool bags, beach umbrella's in the cottage for your use. I cannot recommend this place highly enough, we've booked to go back twice next year. I can honestly say we've never felt so relaxed on holiday before. I've told all my friends about this amazing little cottage, but only have securing my own bookings for 2019. What a review Gary and Lisa. You always make me feel half my age when you are here. I am very lucky I really enjoy what I do. And you both make it so easy for me. 7 minuti in auto a Moncarapacho, dove si ha un mercato locale e piccoli supermercati. 10 minuti Estoi - Tempio romano, palazzo C19th. Tavira 20 minuti, atomsphere veneziano, confine spagnolo 30 minuti. Città cubista di Olhao con fantastico mercato di pesce e frutta. Siviglia 1 ora e 40 minuti Lisbona 2-3 ore.
Moncarapacho ha tutto un mercato ortofrutticolo, ottimi ristoranti, piccoli supermercati aperti 7 giorni su 7. O vai giù alla 125 strada e hai ALDI, LIDL. Si possono organizzare gite di pesca in mare, avvistamenti di uccelli e delfini e spedizioni subacquee. Visita al centro del parco di Ria Formosa (molti uccelli rari). IN FUSETA, hai sport acquatici come Kite Surf, Tour in barca, Stand up Paddle, kayak, sci d'acqua. Inoltre, c'è un altro taxi acqueo, ha così tante informazioni locali e ti porterà in tutte le diverse isole, al largo della costa. Oppure ci sono anche traghetti e taxi acqueo in OLHAO, INOLTRE PORTARTI A TUTTE LE ISOLE. TAVIRA è una città bellissima, e vale la pena esplorare, mi ricorda una Venezia sbiadita. L'architettura è davvero unica. È il lato incontaminato dell'Algarve ed è molto portoghese. Booking Notes: 50% with booking form, balance 6 weeks before arrival. Changeover Day: Flexible, but must be one week minimum in high season. Notes on prices: Prices are for property per week in pounds (Sterling).